Ray Evernham's "ForPly" 1964 Plymouth Belvidere hard top rests on a full NASCAR COT chassis - Tom Hoover's Max Wedge is as stock as they come . . . sorta. ForPly & Hoover's 1964 Plymouth - similar, yet way, way different. 1964 was a very pivotal year in Chrysler racing. The Ramchargers had concluded a dream season in 1963 by winning Top Stock Eliminator at BOTH the NHRA Winternationals and Indy US Nationals with 1963 426 Max Wedge Dodges. The 426 Race Hemi debuted in February 1964 with Richard Petty winning his first NASCAR Daytona 500 in a 1964 Plymouth and similar Plymouths sweeping the first three places. The most advanced Max Wedge engine, including an improved cylinder head, was delivered in 1964 Plymouths and Dodges beginning in fall 1963. Later, similar 1964 Plymouths and Dodges were delivered with 426 Race Hemis intended for both NASCAR and drag racing. Thus, the '64 Plymouth exemplifies the pinnacle of Chrysler's race efforts at that time. What we have outlined here are two cars that two professionals chose to reproduce to commemorate the era - but what makes this story so great is that these two individuals chose to build the same car, but their result is a direct representation of their life's experiences. Tom Hoover Jr's. father was none other than Tom Hoover of Ramcharger and Hemi fame. Tom Hoover Sr. joined Chrysler Corporation in 1955, earning a Master's degree in automotive engineering at the Chrysler Institute. One of Hoover's first projects at Chrysler was the Bendix fuel injection system ("Electrojector"), an early version of today's electronic fuel injection systems. While Tom is best known as the "Father of the Hemi", Chrysler Corp's second generation racing engine, many may not know that he was heavily involved in the development of almost all the performance engines produced by Chrysler in the early 60s - from the slant six "Hyper Pack", through the Max Wedge 426 and up to Chrysler's monster 426 Hemi. Growing up in this performance engineering household with Ramchargers dropping by and Super Stock cars in the driveway had a direct influence on Tom Jr's selection of a Chrysler product to go Pure Stock Muscle Car drag racing. As such, Tom choose to build a 1964 426 Stage III Max Wedge. His plan to what to do with a 1964 Plymouth Belvedere was directly influenced by father's experiences in the 60s. (A feature in No Limits Magazine tells the story of Tom's car). Another individual influenced by these events was Ray Evernham. Ray joined the Jeff Gordon NASCAR team as Crew Chief in 1991 and between 1992 and 1999 won 47 Cup races and 3 Cup Championships. In 2001 Evernham led Dodge's return to NASCAR Cup racing and worked as an analyst for ESPN NASCAR coverage until 2011. At that point in time, Ray started Ray Evernham Enterprises to design and build custom cars. His choice for his first design & build "“ what else "“ a 1964 Plymouth. Understand, the '64 pick was not an accident. Ray loves old MOPAR iron and is a big fan of 1969 Daytona Chargers. (Ray's ForPly is also featured in No Limits Magazine as well). Ray designed a 1964 Plymouth that rests on a race-documented NASCAR Sprint Cup COT chassis with a NASCAR Dodge Racing engine. No Limits Magazine is going to do a full feature on the car in an upcoming article, but this story is the tale of two designs and two builds. One, built by the Hoovers is a pure stock Max Wedge intended for drag racing. The second is a full "ModStock". Ray's Plymouth marries the nostalgic appeal of a modified American muscle car with the brutal prowess of a stock car. 1964 Plymouths feature "uni-body" construction, and as such, there is no "frame". To comply with the rules at the Pure Stock Drags, Hoover's '64 chassis must be as built. It has a stock front suspension and engine cradle (referred to as a "K" member") featuring original control arms and torsion bars. Stock manual steering and manual drum brakes are utilized. At the rear, we find a Chrysler 8 ¾ "Sure Grip" rear axle assembly running an optional 4.30:1 gear set. The heavy-duty rear springs are biased. The right spring includes an additional leaf to eliminate torque steer. Heavy duty shock absorbers and rear manual drum brakes complete the chassis. The car rolls on original 14" X 6" steel Chrysler wheels with reproduction bias-ply tires. The Evernham "ForPly" car's chassis is a Daytona 500 race-run NASCAR Sprint Cup Series COT chassis modified for driver/passenger entry. At the front there are unequal-length, fully adjustable upper and lower control arms with coil springs and front anti-roll bar. The rear of the chassis is a NASCAR trailing arm setup with a fully adjustable Panhard rod and rear anti-roll bar. A 9-inch Ford-type rear axle with a 3.60:1 gear ratio puts the power to the ground. Brakes front and rear are NASCAR disc brakes - 13-inch diameter front, 11-inch diameter rear with ventilated, grooved rotors and four-piston calipers. NASCAR Sprint Cup shocks are fitted all-around and it rolls on custom, 18 x 9.5-inch NASCAR-style aluminum wheels with nickel-plated lug nuts and 285/40ZR18 101W ultra high-performance street tires. The Hoover's drivetrain must be a configuration originally available from the factory. Its 1964 426 cu.in. "Super Stock-III" Max Wedge has an original Chrysler cross-ram intake manifold, original "518" cylinder heads, and streamlined iron exhaust manifolds. Although blueprinting to NHRA specifications are allowed, the rules of the Pure Stock Muscle Car Drags dictate no more than a 1.5 addition to the stock original 11.0 to 1 compression ratio. The 3 -peed automatic A727 transmission is controlled by the original push button controls found in early 60s Mopars. The factory advertised 415 horsepower @ 5600 RPM and 470 foot-pounds torque @ 4400 RPM for this configuration. Currently, the car has run a best quarter mile ET of 11.55 seconds and a best speed of 122.58 mph. on reproduction bias ply tires! This speed indicates about 523 actual horsepower at the rear wheels. Evernham's "ForPly" has a reengineered 358-cu.in., NASCAR Dodge Racing R5-P7 fuel-injected V-8 engine (R5 block, P7 cylinder heads) estimated to make 750-plus hp. Power is controlled through a NASCAR 4-speed transmission. Dual NASCAR stainless steel exhaust headers with left and right side exits feed NASCAR ceramic-coated exhaust system with mufflers integrated within the 4-inch exhaust tubing. The Hoover's 1964 Plymouth Belvedere is "box stock" both inside and out. Like most drag cars from this era, Hoover added a small gauge panel beneath the dash and a dash mounted tachometer. Painted its original dark blue metallic color, the only outward "clues" to its prowess are the red line tires and the discreet "426" indication in the hood ornament. The stance is pure 1964 street. Evernham's Plymouth body received a few mild changes during restoration that mix street rod and race car esthetics. Door handles were shaved off. Stainless trim was polished to a mirror shine. Front wheel wells were raised 1.5 inches so the body could sit that much lower over the tires. A body line on the hood disappeared. A carbon fiber air splitter was fitted to the bottom of a lightly reshaped front bumper. The trunk lid is stock but now sports an aluminum stand-up spoiler. The driver-side rear quarter panel has a NASCAR fuel filler neck that leads to a race-spec 18-gallon fuel cell, but the neck has been modified to accept a standard gas station nozzle. Evernham chose a shade from Sherwin-Williams Automotive Finishes called Radiant Red with Graphite racing stripes and accents. The paint's "eggshell" texture really complements the Plymouth's vintage. The stance is very "road warrior" aggressive. So, what do we see in this comparison, BOTH cars are purpose built for specific tasks. The Hoover car is built to compete in Pure Stock Muscle Car Drag events "“ and it does that quite well. 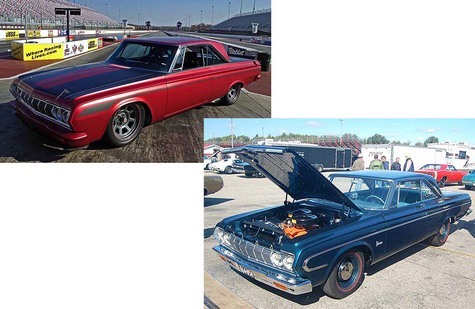 At the 2012 Pure Stock Muscle Car Drags it qualified as both the quickest Chrysler and the quickest steel car with an iron engine. Evernham's ForPly is built to provide the maximum road experience that melds the best of 1964 Mopar styling with the best of Dodge NASCAR technology. No matter whether you like old school or new/old school - you can appreciate that these cars are beautiful executions for two different purposes!! As we said in the beginning Something old - Something New . . . but in both cases - SOMETHING COOL. Click HERE to read more about the ForPly at Ray Evernham's website! Click HERE to see The ForPly exposed. It is a detailed look at Ray Evernham's beauty! Click HERE to see the Tom Hoover Jr 1964 Plymouth 426 Max Wedge story! Tom Hoover Jr. 1964 Stage III Max Wedge can get it done!